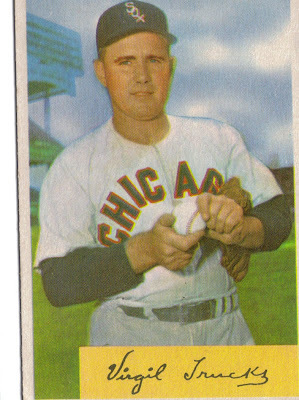 Spent most of his career with Detroit, but pitched for the Sox in the mid 1950s. 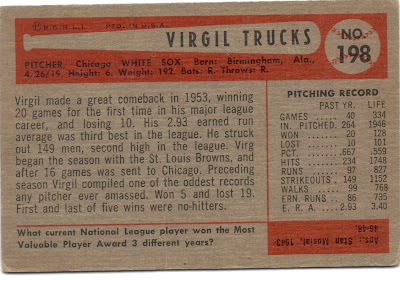 I remember having a Virgil Trucks baseball card when I was a kid. Trucks was the starting pitcher for my first Sox game on July 15, 1955. Sox beat the Senators 5-4. Sox scored 2 runs in the bottom of the ninth with Dixie Howell picking up the win in relief. In 3 seasons with the Sox he was 47-26, pretty damn good, wish we had a few starters like him right now. Last edited by LITTLE NELL; 03-25-2013 at 04:09 PM. Great great pick up by the club. Won 20 games one year, threw two one hitters within a month or so of each other. June 14, 1953 - The Sox acquire pitcher Virgil “Fire” Trucks in a five player deal with the Browns. Trucks would fire a pair of one hitters and win 20 games during his time on the South Side. May 1, 1954 - Sox pitcher Virgil “Fire” Trucks tosses a one hitter in beating the Red Sox 3-0. The only hit he allowed came in the 6th inning, a single by future White Sox outfielder Billy Goodman. It was the first of his pair of one-hitters for the 1954 season. July 6, 1954 - Virgil “Fire” Trucks throws a one hitter at Detroit beating the Tigers 4-0. It would be the second one hitter thrown by Trucks in a little over two months! On May 1st he beat Boston at Fenway Park, 3-0 with a one hitter. Billy Pierce and Virgil Trucks in 1953 were an awesome combination in 1953. I too, had a Virgil Trucks baseball card. Trucks was an excellent pick up for the team way back when. He was one of the best and most durable pitchers of his era. Trucks may have been pretty close to being a hall of famer had he not lost time during WWII. I read that he answered every letter he received though he was getting dozens every week. My ethics professor in college was close friends with Virgil Trucks. Rest in peace, Mr. Trucks. He was included in the original lyrics to Van Lingle Mungo, rhyming with Johnny Kucks. He also had one of the most bipolar seasons in baseball history the season before coming to the White Sox. In 1952, he was 5-19 with an ERA of almost 4, which wasn't very good in a season when the 10th best ERA among starters was 2.90 and there were only eight teams in the league. Taking away just three of his wins, this three shutouts, he would have had an ERA of 4.6. One of his shutouts was a one-hitter. Two of his shutouts were no-hitters. FWIW, Butch Trucks, original drummer for the Allman Brothers, was Virgil's nephew. I never knew that, I just looked him up on wikipedia and it also says his great nephew is currently part of the Allman Brothers group. Anyways RIP to Virgil Trucks. He was a great pitcher who does deserve more recognition for the Hall of Fame. He was the last guy who was alive who beat the Cubs in a World Series too.